This, the second version of the SoundLink Mini Bluetooth speaker from Bose, delivers a rich and full sound with deeper bass than you’d imagine from a speaker system that is small enough to fit in the palm of your hand. It’s easy to take Bose sound with you anywhere as this quality speaker system is both wireless and compact, plus setting it up and connecting to audio devices is easy with clear voice prompts to make Bluetooth pairing straightforward. The built-in speaker-phone also allows you take calls with clear sound quality. The Bose Soundlink remembers the last six devices used, so reconnection is quick and automatic, and the included charging cradle allows you to use almost any USB power sources including a laptop or in-car charger. The SoundLink Mini speaker looks the part too, with a sleek single-piece aluminium design that is ideal for any home or office setting. The speaker can last for up to 10 hours of wireless music playback on a full charge, delivering big sound with deep bass for an incredible listening experience. The system works especially well when connected to an iPhone or similar smartphone and used as a speaker-phone, this allows you to leave your mobile phone in an area of good reception, while making calls in comfort elsewhere. The sound quality and volume from this speaker blows most people away – when you first pair the device and listen to it, it’s hard to believe that the sound comes from a package that small, Bose have definitely included some magic in their Soundlink systems! It’s easy to ue too, the functions are all simple with just on/off, volume, pause, fwrd and backwrd buttons which are self explanatory. 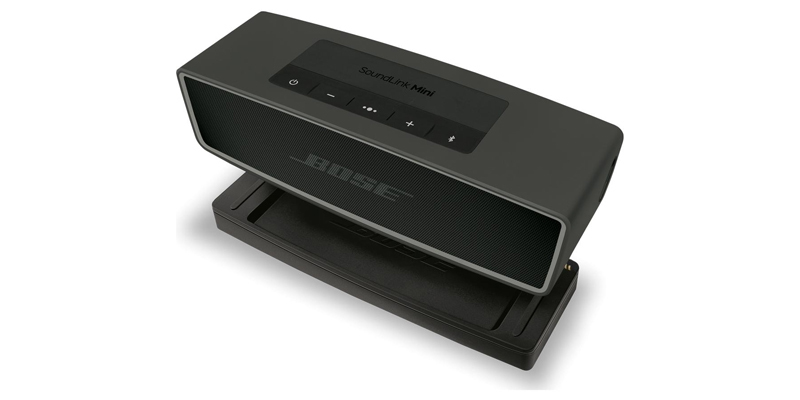 You can even connect the Bose Soundlink using a 3.5mm jack so it will work perfectly well with older audio systems that are not Bluetooth enabled.